Spacious good performing yacht with mahogany timber fitout and standard inclusions that other builders call options. 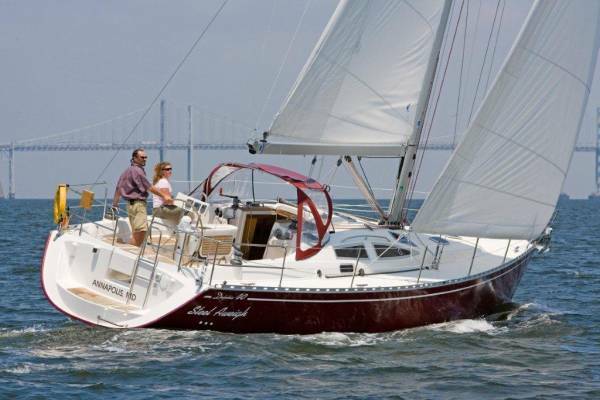 Standard boat has 2 aft double private cabins, v berth forward, 2 heads with showers, H&C water, headsail furler, 12V refridgeration, wired 240V ac and 12V dc. Call for full list of standard fittings and short list of optional extra's. New for '10 are Corian galley benchtops, new fabrics and cushion stylings, and priced from an incredibly low $298000. 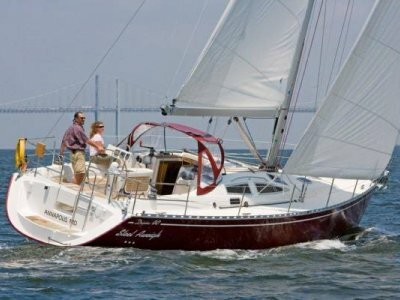 Allt the fixed keel versions of Delphia Yachts, including the D29, D31, D34, D40.3, D46 and D47 are "A" class rated for open ocean or bluewater sailing. Pricing is indicative of a new standard factory equipped boat and can vary with equipment changes and currency exchange fluctuations. Pricing correct as at January 2019, but please ask for an update. Fin keel, deep or shoal draught, cast iron, plus centreboard option. Volvo 40HP with saildrive and fixed 2 blade propellor. Yamnar and Nanni diesels are optional as is shaft drive. Engine room: Good engine access in saloon and removeable side panels in aft cabin. Inbuilt fire suppresion. Wheel steering, single lever engine control, emergency steering tiller. Balanced rudder on 88mm solid stainless shaft wit roller bearings. 210Litres in stainless steel tank. 350 litres in stainless steel tank. Corian bench tops, double stainless sinks with separate timber covers, 3 burner Smev stove with oven, single lever tap with hot and cold water, good counter and storage space in this easily worked entertainer galley. Dual anchor rollers on stainless bow fitting, 1000W 12V anchor winch, 16kg Delta anchor with 50m x 8mm gal chain. As per state transport dept requirements in consultation with owner. LPG solenoid and gas detector. 2 x 105AH gel AGM house batteries, 1 x 75AH strt battery. Leab battery charger with dual battery CDB system Wired 240V ac and 12V dc, BEP master electrical panel with automatic fuses, main switches and indicater of battery charging, volt meter, BEP level gauges for fuel and water. Hot water service, Fusion stereo with am/fm/vhf/ipod/usb, 2 speakers in cabin and two in cockpit. Furling genoa, 41.6 square metres. Selden aluminium mast, double spreader, 9/10. Anchor light, masthead and deck spotlight. Stainless steel standing rigging. Two Lewmar 48 self tailing sheet winches. Two Lewmar 30 self tailing winches. Ask for full details on standard inclusions, and options. Are available is optional 2 cabin version, and 4 cabin in survey charter version. For more information on this boat, please fill in the following form and we will contact you shortly.